Gorgeous milky white moonstone and silver necklace. This is a terrific necklace with 6 beautiful milky white oval moonstones each approx 6mm. 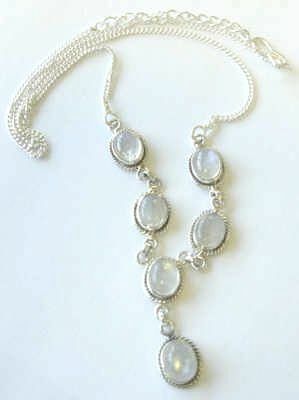 Each lovely moonstone is set in gorgeous silver which has a really pretty simple pattern and all the stones are linked to each other with silver chain links with 2 moonstones coming down to hang nice and floaty towards the chest. The stones are hung connected to a silver chain, one side large links and the other half small, so you get a really different and interesting design. The clasp has a nice 'S' shape hook clasp. Necklace comes in free velvet pouch or box - please specify.